Even though Cassandra faded away as a network in the late 1980’s, it has lived on in the hearts and minds of many, even some of its most staunch critics and opponents! Cassandra was referred to publicly as “the radical fringe” for many years. 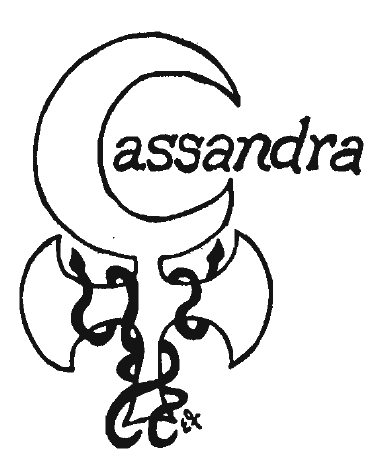 We have been remiss in not archiving accounts of the many positive things that have grown out of the seeds planted by Cassandra, so this page will serve as a “repository” of all things Cassandra-related! Cassandra Cleveland Web materials are archived at the Medical Heritage Center, Prior Health Sciences Library, The Ohio State University 376 W. 10th Ave. Columbus, OH 43210. Here is a PDF that shows details of the collection. When I was in my BS completion program in the 80s, one of our best instructors mentioned Cassandra, and we all laughed that she used the words “nurse” and “radical feminist” in the same sentence. Now I understand! Thanks to Cassandra’s founders and members.